Captain Alan M. Haefner is a native of Wilmington, Delaware. Upon graduation from the University of New Haven, Connecticut with a BS in Criminal Justice, he attended the Navy’s Officer Candidate School in Newport Rhode Island and received his commission in 1974. After attaining his Surface Warfare Qualification during his initial assignment as a plank owner onboard USS Tarawa (LHA-1), he entered flight training and was designated a Naval Aviator and Helicopter pilot in 1977. Captain Haefner’s initial aviation assignment was with the Golden Falcons of HS-2 where he made two deployments to the North Arabian Sea onboard USS Ranger (CV-61) during the Iranian Hostage Crisis. In June 1982, Captain Haefner reported to Commander, Naval Military Personnel Command where he served as the Special Placement Officer for Graduate Education Programs. Assigned to the Taskmasters of HS-10 in October 1984, he served as a flight instructor and ferry pilot in the SH-3 Sea King helicopter and as the squadron Training Officer. In January 1986, Captain Haefner reported to the Chargers of HS-14 and served as the squadron’s Administrative, Operations and Maintenance Officer respectively. During his tour, he deployed twice onboard USS RANGER (CV-61) in support of SEVENTH Fleet surge operations off the coast of North Korea and to the North Arabian Sea for Earnest Will Operations. In July 1988, he assumed the duties as the Flag Secretary to Commander, Anti-Submarine Warfare Wing, U.S. Pacific Fleet. 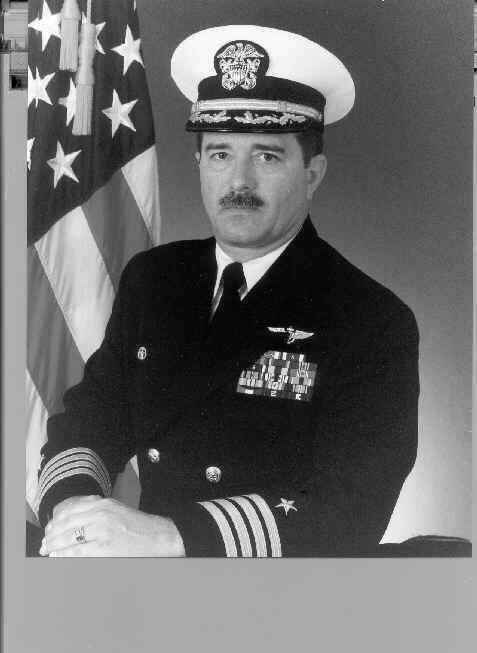 Captain Haefner reported to the Eightballers of HS-8 as the Executive Officer in March 1990, and was on station onboard USS Independence (CV-62) at the start of Operation Desert Shield. Upon assuming command of HS-8 in June 1991, he led the squadron through the unprecedented forwarded deployed CV-swapout of USS Midway (CV-41) and USS Independence (CV-62), and then full transition from the SH-3H Sea King to the SH-60F Sea Hawk helicopter and airwing integration. In 1993, Captain Haefner graduated with honors from the Australian Joint Services Staff College in Canberra Australia, and returned to the United States to assume the duties as Executive Officer of the aircraft carrier USS Constellation (CV-64). In July 1995, he reported to the Pentagon as the Chief of Naval Operation’s In-Service Aircraft Carrier Program Officer until reporting for command of the USS Juneau (LPD-10) in November 1997 while deployed forward supporting Fifth Fleet operations and in July 1999 he conduct the first ever forward deployed crew swap and Exchange of Command with the USS Dubuque (LPD-8). In September of 1999, Captain reported to the Staff of the Commander, Naval Air Forces U.S. Pacific Fleet as the Assistant Chief of Staff, Plans, Operations, Requirements and Readiness and then as the Chief of Staff. Returning to command in February 2001 of Amphibious Squadron Five, he deployed as the Commander, BELELAU WOOD Amphibious Readiness Group in support of Operation ENDURING FREEDOM serving as CTF 51. During this same period, the University of Maryland University College awarded him his Master of Distance Education. In January 2003, he came ashore for the final time and took the post of rear echelon Deputy Commander, Amphibious Group Three and Amphibious Task Force Commander, Iraqi Freedom. He retired from active duty 8 August 2004 in ceremonies onboard “his ship” USS Tarawa (LHA-1). Retirement years included Business Development Executive positions with Raytheon until 2012 and multiple Board and Executive Committee positions with local non-profits. Captain Haefner accumulated more than 3,500 flight hours and over 2,500 aircraft carrier and shipboard landings. He made four rescues at sea of downed aviators. His decorations include the Legion of Merit (3 Gold Stars), the Meritorious Service Medal (2 Gold Stars), the Navy Commendation Medal with Gold Star, the Navy Achievement Medal, and numerous other unit and service awards. Captain Haefner is married to the former Lorraine Clavet of Wilmington, Delaware since 1974 and they reside in El Cajon, California.